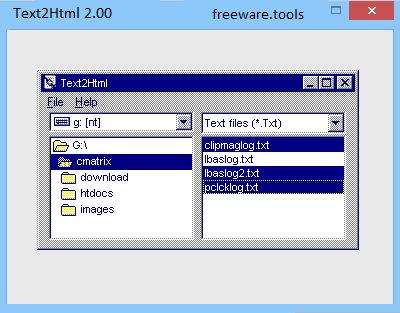 Text2Html is a freeware text-to-HTML converter. This application is in designed to quickly convert many text files into HTML format. Text2HTML handles HTTP, FTP, Gopher, Telnet, WAIS, NNTP, and Mailto tags. Multiple files can be converted simultaneously. Text2Html converts text files to HTML with an easy-to-follow format that is so convenient youll want to create a desktop icon for a quicker access. Text2Html is a handy tool for text conversion. It eliminates any hassle of rewriting text files in HTML. Simply stated, you can quickly convert text documents to HTML format files with ease with options to specify visual options of content, change font and other settings. All web pages you visit are all built with tons of lines of code, depending on the complexity and amount of content. There are numerous applications that let you build pages, but it can also be done in a plain text file. However, the TXT file can’t be used to run the page, but Text2Html can help you easily convert it. It takes a little while to get the application installed on your computer, with the main window showing up as soon as you’re done with the setup. The interface pretty much speaks for itself, but it’s not the place where the actual conversion takes place, because the main function is actually triggered from the context menu corresponding item. The main window, however, can be used to define the general look and feel of content, with options to enable color and customize the way text and links are shown, as well as the text itself and the background, if it’s not specified in the TXT file. More options let you confirm file name, use the first line as a title, make tags uppercase, or have links opened in new windows. Text2Html gives you the possibility to work with template files, to which you can add meta tags. In addition, the template file can be fitted with multiple macros, for less management effort. Other customization options refer to the text itself, with a few options for font, and title size. As mentioned above, conversion is done via the context menu. Right-clicking on a TXT file lets you initiate the process, with a small prompt that requires you to write down, or paste the full path, file name, and extension of the new HTML file that is created. All in all, Text2Html is a practical little utility that comes in handy for web developers, especially with the various options to customize general content settings, thus requiring even less code writing. What’s more, clever integration in the system context menu makes it incredibly easy to use, so you don’t have to rely on different windows or crowded prompts.